Mustache Baby is due in bookstores in May 2013 (Houghton Mifflin, illustrated by Joy Ang). When Baby Billy is born with a mustache, his family (shown here,) must wait to see if it is a good guy mustache or a bad guy mustache. 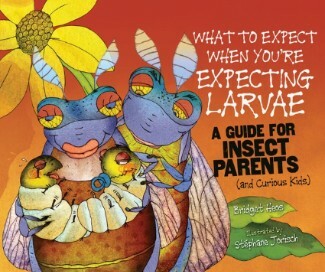 What to Expect When You're Expecting Larvae: A Guide for Insect Parents (and Curious Kids), by Bridget Heos, illustrated by Stephane Jorisch, Lerner/Millbrook, Spring 2011. 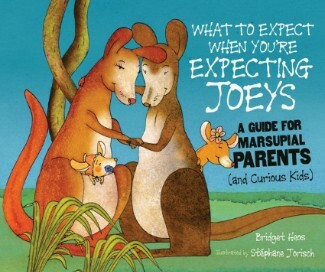 What to Expect When You're Expecting Joeys: A Guide for Marsupial Parents (and Curious Kids,) by Bridget Heos, illustrated by Stephane Jorisch, Lerner/Millbrook, Fall 2011. What to Expect When You're Expecting Crocs and Gators: A Guide for Crocodilian Parents (and Curious Kids,) by Bridget Heos, illustrated by Stephane Jorisch, Lerner/Millbrook, Spring 2012. Butterflies. It's always the butterflies. I, Fly, about a fly who wishes second graders would study him instead of those fancy-schmancy butterflies, sold to Sally Doherty at Holt. Release date TBA. 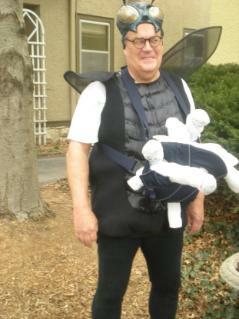 Shown here: my dad getting in the spirit...dressed as a fly with maggots in a front pack!